Tory is a partner, a mother, a friend, a physio, an athlete. Or trying to be an athlete again. She was a member of the Australian Rowing team from 1991 – 1996, winning the World Junior Championships in the women’s pair in 1992 in Montreal, and winning a silver medal in the Women’s pair at the 1993 World Championships in Prague, and a Bronze medal in the Women’s Four at the 1994 World Championships in 1994. Tory was a rowing scholarship holder at the SA Sports Institute from 1989 – 1996 and at the Australian Institute of Sport 1994 – 1996. She retired from elite level sport in 1996 after the Atlanta Olympic Games at the age of 22. 15 years later, she decided to tie the running shoes on and transform herself into a distance runner for charity! Most of those 15 years had been geared towards career – finishing university (put on hold whilst rowing), and establishing herself as a women’s health physio in Adelaide, and towards family, raising her two young children. Fitness had been sporadic in the intervening years. A little bike riding, mainly in short bursts in preparation for the Amy Gillett Foundation rides each year ‘Amy’s Ride’. 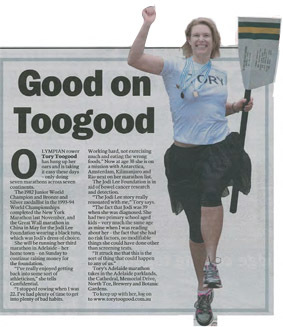 An opportunity for a short venture into competition arose in late 2009, when Tory had an opportunity to join the Grange Surf Lifesaving Club women’s boat crew. The team was selected as a SA State representative team, and the girls placed third in their interstate competitions and were well placed in the top 30 or so entries at the Australian Surf Lifesaving Titles before poor weather cancelled the competition in 2010. But for 2011, Tory had a bigger goal. Tory was training to run the New York Marathon 2011!!!! The biggest marathon in the world. 120,000 people apply to run the five bridges and five boroughs race. 45,000 get in. Thanks to her partnership with the Jodi Lee Foundation, she was one of those 45,000. She ran from Staten Island, through Brooklyn and Queens, into Manhattan, through the Bronx, back to Manhattan and finish in Central Park, 42.195 km later. She will not walk. She promises. To everyone who supported me in 2011 with my fundraising. 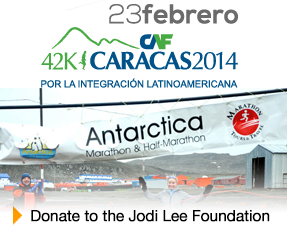 I raised over $10 500 for the Jodi Lee Foundation, so thank you all. Please have a look around the rest of this site - there is a lot of information about bowel cancer awareness, general health and preventative medicine, my efforts in training for my first marathon after starting to run at the age of 37, and other musings as a runner. I have continued to maintain the blog since, charting my revised goal of running a marathon on each of the 7 continents and my various running adventures along the way. Running has given me amazing opportunities over the last 5 years; I have travelled to all 7 continents, although that South American marathon is yet to be completed; I have made hundreds of new friends and am inspired by them every day. There is so much of the world to see, and I find that participating in events is the perfect excuse to travel, see different parts of the world and meet more people with passions that intersect with mine. Thank you for sharing this adventure with me.